The Cardigan Welsh Corgi is an excellent cattle dog and farm guard. The Corgi drive cattle by barking and nipping at the cattle's heels. Their low height helps keep them from being kicked by cattle. The Cardigan Corgi differs from the Pembroke Corgi in several respects. It has a full tail that is never docked. It is larger and longer with ears that are larger and more rounded. They come in a wide variety of colors. The Cardigan is a very active, intelligent dog with an affectionate, alert and even temperament. The name "Corgi" comes from the Celtic word for dog and they are thought to be desendants of dogs the Vikings brought to Wales. 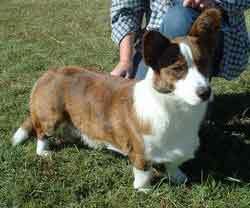 A small dog the Cardigan Welsh Corgi stands 10-13 inches at the withers and wieghs from 25 to 33 pounds.